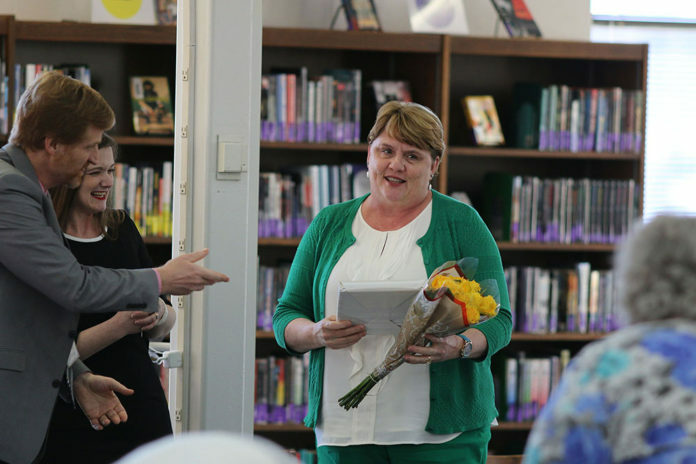 Teacher of the Year Jan Buetow accepts her award from English teacher Beth Andersen on Tuesday, March 19th at the faculty meeting. Photo by Royals Media Staff. Assembled in the library on Tuesday, March 19th, the faculty and staff listened to Principal Mike Nelson and English teacher Beth Andersen speak about the importance quality teachers who go above and beyond the call of duty. Nominated and selected by a panel of teachers, math teacher Jan Buetow was named the 2019 Teacher of the Year. A quite emotional Buetow thanked her D-wing family, a wing she said is the best in the building. Buetow also said that her cooperating teacher Kristen Dize was the key to her success in her class. Buetow now will present her teaching philosophy to the Prince George County panel of school board staff who will select a teacher to represent the county in Region 8.